Even if a Roman sauna's not your thing, hot venue Fire gives a good reason to head to Vauxhall this weekend. While their drinks might be manky, Red Bull have scored a coup in bringing three electronic juggernauts to kick off one epic night. For those late to the party, Mala makes dubstep in its purest, most unadulterated form, before the aggressive bass drops, new-era caps and general fratboyism turned Britain's most exciting new genre into a tauine-soaked soundtrack for Call of Duty marathons (sorry Red Bull!) 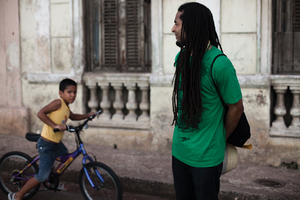 Mala is currently riding high on the success of his "Mala in Cuba" record, the fruits of an exercusion to the tropical haven that mixes his swirling dub production with snippets of Cuban instrumentation. What could have been a naff exercise in exoticism is made great by the producer's restraint - in never letting his samples dominate his slow, shuffling sound. Returning to his South London roots tonight , Mala's earthy sound brings a welcome shot of colour to an oft dour scene. Someone never accused of being dour is Detroit's premier sleaze ball Jimmy Edgar. "I Wanna Be Your STD" may not be the world's greatest chat up line, but it's one hell of a single - skittering ice-cold beats topped with Edgar's robotic come-ons. Mixing vintage electro elements in gleaming new production, while The Weeknd may have copped his lonely-creep shtick wholesale he doesn't come close to Jimmy's vision. After a brief period of inactivity, the Martyn machine is back rolling again. An appearance on Boddika's "Think and Change" compilation, and a new EP for Steffi's Dollydubs imprint have set the scene for that imminent third album. While the swinging-house samples don't point in any new direction, never try and second-guess this most mercurial of producers. Hemlock Record chief Untold, and Playgroup's Trevor Jackson complete Saturday's star studded line up. Red Bull Music Academy and The Upfront Project with Jimmy Edgar, Mala, Martyn at Fire, SW8 1UQ. Saturday 16 March. Tickets and information here.